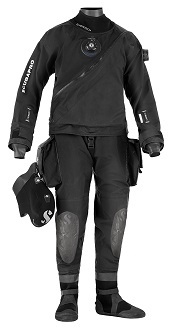 The Evertech Dry Breathable is a premium trilaminate drysuit designed for avid divers and loaded with features. Built with a breathable fabric nylon/PU/nylon trilaminate blend, stitched and waterproof taped seams, a diagonal front waterproof zipper, a Si-Tech ring seal system for wrists and neck and Si-Tech valves, this fabric suit is top quality throughout. A pair of large cargo pockets, lightweight attached boots and blue suspenders are just a few of the standard features included with a suit designed to keep you warm, dry and comfortable in all water conditions. Breathable nylon/PU/nylon trilaminate design allows body perspiration evacuation, but keeps water out. Seams are stitched and waterproofed taped twice for maximum reliability. Front diagonal BDM metal dry zipper keeps water out and makes self-donning easy. Si-Tech ring seal system for latex wrists and neck allows for the quick replacement of damaged latex seals or the use of optional silicone seals. Warm neck collar keeps heat in and helps protect the latex neck seal. Quality Si-Tech valves ensure efficient and trouble-free airflow control. Attached semi-rigid boots feature a thinner sole and rubber reinforcement for lightweight flexibility. They include Velcro straps to personalize fit while preventing air from traveling to the feet, as well as fin strap retainers. Two large cargo pockets are equipped with D-rings, high-security over-flaps and Velcro closures. A hook is provided on the right-thigh utility pocket for attaching a hood. I-Safe straps on both arms offer a secure mounting spot for a wrist computer. Blue suspender system is easy to see, enhances fit and provides convenient lower suit support between dives. Hood features an air vent system, smooth-skin collar, Diamond Span interior and a hook for securing to the cargo pocket. Includes hood, carry bag, low pressure hose, repair kit and owner’s manual.